I just love it when I have the day off and there is a great yard sale!! Today is Thursday and I found an awesome yard sale. It was held at the Cat’s Corner, which is a no-kill cat shelter here in Hampton, VA. I also love it when the sale is a benefit. The sale started at 8 am and I was there shortly after, as soon as I could get there after putting my 9 year old on her school bus. I scored some great stuff! 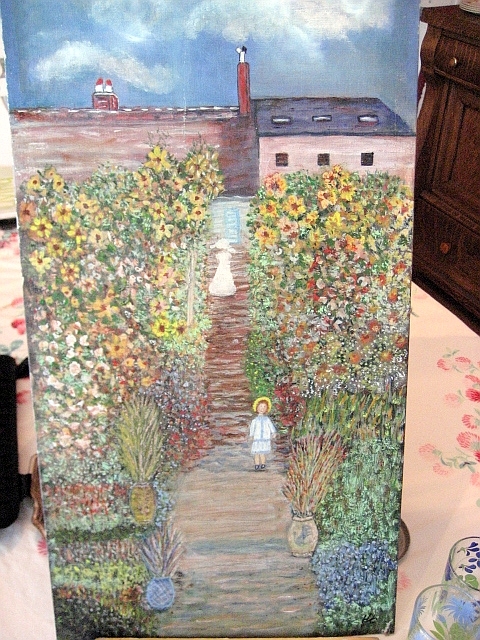 This is my favorite, an amateur oil painting title "In the Garden", dated 1989 and signed by the artist. LOVE IT!! It has such a folk art vibe to it. 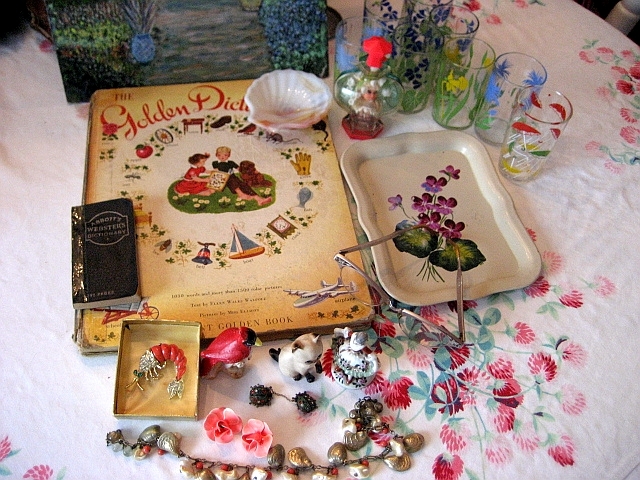 My other treasures included 8 floral swanky swigs, a Giant Golden Book Picture Dictionary (very cool illustrations), a tiny vintage pocket dictionary, handpainted violet Nashco tole tray, Kiddle Kologne, vintage etched aluminum cat eye glasses, 3 figurines, an abalone shell, sea shell charm & mother of pearl necklace, crayfish brooch, lady bug pins, akro agate seashell ashtray and not pictured but a very cool handmade wooded painted white garden trellis. The figurines will end up on fabulous pin cushions made by my BFF Beth and the eyeglasses and kiddle kologne will go to eBay and fetch enough to cover the cost of this yard sale bonanza. I love it when you find cool stuff and something that you can pass along to another collector and it will pay for all that you keep. I have signed up for the bits-n-pieces swap over at Jenny’s blog. Looks like a lot of fun. I love a swap when everyone is crafting the item for the swap. 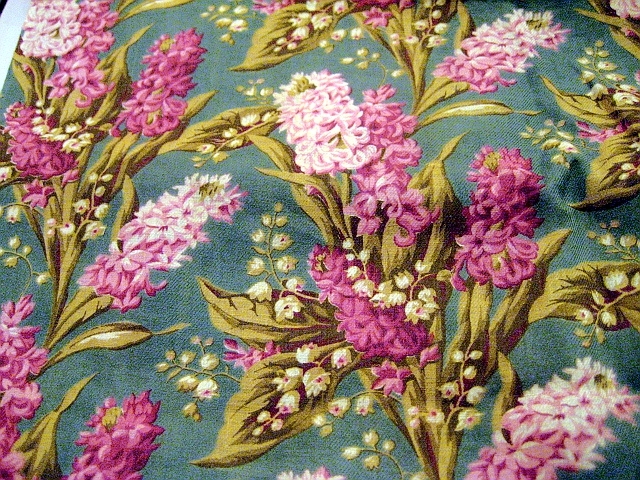 To end this entry I have photographed two vintage fabrics. This first one is a new piece that I recently acquired from eBay. The second is just a to-die-for vintage faille. Stunning! Great stuff you got there. I adore those eyeglasses! Wow! You really hit the jackpot! There’s not a ‘throw back’ in the bunch. Love the painting and the Golden Book dictionary…How cute is that!? Your vintage fabrics are pure eye-candy. That hyacinth and Lily-of-the-valley…yowsa, so pretty! 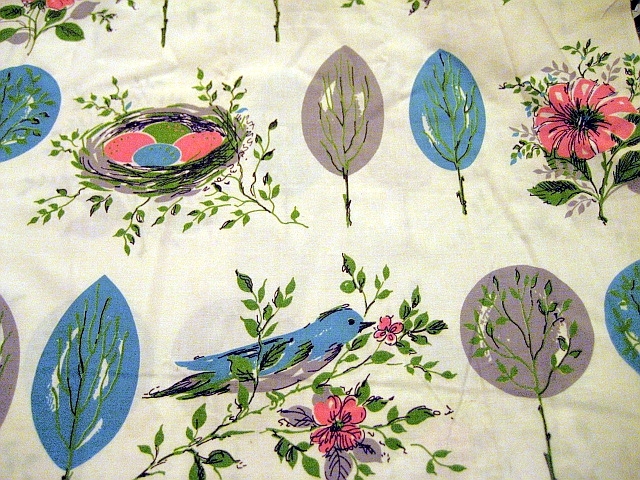 I love the bird and nest fabric! It’s just lovely! You have a great fabric collection!You lucky thing! I absolutely love your vintage fabrics!!! I have recently discovered several blogs by ladies with very similar interests, and I just love it. All of you inspire me.